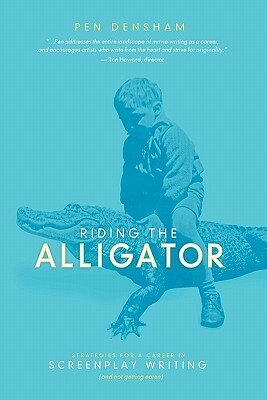 Riding the Alligator is the first book that explores both specific screenplay writing techniques, while simultaneously imparting industry-tested strategies for carving a successful, long term career. Hollywood filmmaker Pen Densham's 14 feature films and numerous TV series have grossed over $1 billion to date. In Riding the Alligator, he reveals his emotional philosophies, triumphs (and failures) and countless professional secrets, plus insights from his company, Trilogy Entertainment Group. Subtitled Strategies for a Career in Screenplay Writing (and not getting eaten), Pen imparts an inspiring philosophy on choosing an artistic career and overcoming the many challenges, such as managing stress and self-doubt, to selling yourself and pitching your work, to finding an agent and being true to one's nature, all while carving a lasting and satisfying career. Pen Densham draws from his own, successful self-taught approach to the industry. He speaks from a place of tremendous empathy for writers, as someone who personally identifies with their creative struggles. He believes there are many right ways to find your voice as an artist and so, going one step further, Pen has included short essays from some of Hollywood's top screenwriters, including , Nia Vardalos, Eric Roth, Laeta Kalogridis, Ron Shelton, Robin Swicord, and Tony Peckham, who each share their particular perspective on their art and career. • Written by successful Award Winning Producer-Writer-Director and USC adjunct professor Pen Densham. • Tactics for screenplay writing, and creative entrepreneurialism. • Instant Library summaries of 10 popular books on Hollywood, as reviewed by USC Film Students. • Foreword by Jay Roach, director of Austin Powers, Meet the Fockers and producer of Borat. • Gator Glossary and index. • Enjoyable to read, informal in tone, with an optimistic and nurturing approach to creating and writing. • Information based on author's extensive career successes (and failures!). • An optimistic view on dealing with stresses of a lone, creative artist – the writer. • Simple techniques developed by Pen and his company Trilogy for structuring stories and creating compelling characters that stars will want to play. • Personal testimonies on the craft from 12 other top Hollywood screenwriters. Pen Densham is a successful award-winning screenwriter, producer, and director, with an extensive track-record in film and television. He is responsible for writing and producing some of Hollywood's biggest blockbusters, such as Robin Hood: Prince of Thieves, along with some of its longest-running television series including reviving The Outer Limits and The Twilight Zone anthologies.